The PF80 crack monitor is used primarily for structural health monitoring. Based on a rotary precision potentiometer which is driven by the winding/unwinding of a spring loaded spool with a stainless steel wire. 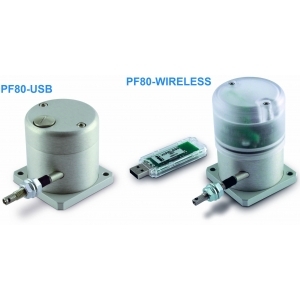 The PF80 crack monitor has a programmable integrated data logger used to monitor cracks, joints and linear displacements by recording displacement and ambient temperature values. Linear measuring length to 80mm. Over 50,000 data log capability. Distance and temperature log with time stamp. Programmable time intervals for data acquisition. Download via USB or wireless. Crack monitor with programmable integrated data logger used to monitor cracks, joints and linear displacements by recording displacement and ambient temperature values. 3D DRAWING AVAILABLE UPON REQUEST.